Truism #2: Only one team can win the championship. Everyone believes #1; no one accepts #2. It gets worse. Not much a coach does at this point of the year is going to appreciably change the team. It’s a little like nutrition for sports. Eating well immediately before an event won’t make you perform much better, but eating poorly will likely make you perform worse. 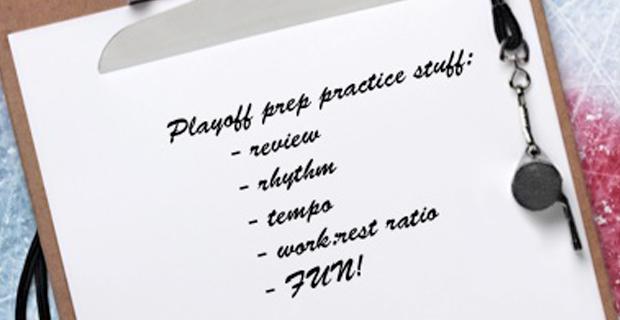 As far as practice preparation goes, it’s much the same. A bunch of crummy practices on the eve of playoffs will make the team lose its edge. Good practices though will keep the team honed, eager, and ready to start. There’s no question the tone around practices before or during a playoff stretch is just not the same. Whether because of outside influences like parents or just the kids themselves hyping the thought of getting their mitts on the trophy, the coach is faced with a variety of new pressures. To begin with, practices at this juncture should not include any new instruction. It’s not because the kids can no longer learn. On the contrary, kids are almost always ready to learn. However there does come a time when the coach should stop yakking and let the reins out a bit. Besides, after months of instruction, it’s perfectly okay not to teach anymore and just reinforce. But how to do it effectively? Perhaps the key ingredient for these practices is get your players out of their regular season comfort zones. With that in mind, playoff-time practices need to have a different tempo and rhythm with a broader array of challenges. You want to expose the kids to a wide spectrum of situations based upon what you taught during the season. When you remove formal teaching from the practice equation, what’s left is reviewing. Coaches often fall back to the same old drills and approaches to review skills and tactics. Repetition has its merits but often a jolt of up-tempo newness will go farther. For instance, if drills used a work:rest time ratio of 1:3 or 1:4 (as those which teach anything new will do), playoff practice drills should be at 1:2 or even 1:1. In other words, quicken the drill pace, have smaller groups doing more reps in a shorter time. The kids will learn to react faster and pay more attention because of reduced “down” time. Drills need alteration, too. What was good in October with minimal or no resistance needs to be tweaked to reinforce those skills against some resistance. Most importantly, everything MUST be fun. Use more small area games, fun activities, relays, whatever works. These keep the kids loose and inject some healthy competitive spirit into practice. Like I said, same thing, only different.